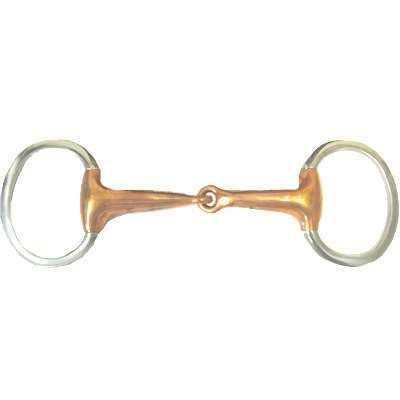 Finding a great deal on a Copper Hollow Mouth Round Ring Eggbutt Snaffle Bit can be difficult. But do not worry as we have a vast selection of Hollow Mouth Eggbutt Bits that are not just made of superb quality but also affordable. The Hollow Mouth Eggbutt Snaffle Bit helps with the horses salivation to keep the mouth soft. This Eggbutt Snaffle Bit will also help apply pressure in different parts of the horses mouth. It is also stationary and the mouthpiece does not move around the ring which prevents pinching in the lips. It also keeps the mouth piece from moving around the ring which will prevent lip pinching. This Hollow Mouth Bit also creates a snapping motion with rings and mouthpiece. It measures 2'' in rings and 18mm mouth. So get yourself a nice set of Hollow Mouth Bits today. When buying from us you can rest assured you will be purchasing a great product.